The dairy industry is a multi-billion dollar industry that has been using brilliant marketing to programme millions of people's minds, including targeting specifically children and mothers, for years. This marketing has been used to create a belief - an illusion - that something is true. Looking at the sheer power that aggressive marketing campaigns can have over us, do most mums out there still believe 'You need to drink milk daily if you want strong bones'. Or, 'Milk is a good source of protein, iron and calcium'? Very sadly, yes, because milk and dairy products (along with bread and meat) currently make up the majority of a British diet. As a child, drinking your mother's milk was completely natural. That's because her milk was full of nutrients and was designed by nature to enable you to make a super-fast growth spurt. This incredible spurt of growth however, happens during a mere 12 to 24 month period and what is really important to note here is that nursing mothers generally stop producing milk after their toddler is aged somewhere between that 12 to 24 months. Those mothers stop producing milk because the need to help their child to grow is over. Milking cows certainly has nothing to do with nutrition. Factory farms that milk cows by machine were implemented to increase the production of milk after the need was created through dairy industry marketing. Milk is for baby calves, not humans. There are approximately 4,500 mammals on the planet and out of those, 4,499 of them stop drinking breast milk from their mum's breast when it runs out. Humans are constantly sucked in by marketing campaigns and when shopping are easily influenced by 'wonder food' labels. Consequently the UK and USA in particular have some of the worst obesity epidemic statistics. Dairy cows are fed on an unnatural high protein diet to boost milk production. Because of this their bulging udders often weigh the equivalent of over 50 kilogram bags of sugar. Obviously this means it is incredibly difficult to walk and lameness is commonplace in dairy farms. Furthermore, because dairy cows are so over-milked, it is also common for over a third of them to suffer from mastitis, an udder infection. This causes their painful, swollen udders to ooze and a copious amount of pus ends up in the milk, as much as 400 million pus cells in every litre. If you're wondering about pasteurization, don't think for one minute that it makes any difference to your health. The process of milk pasteurization was debated in the House of Commons and the suggestion was made that no raw milk should be sold for human consumption. So, was milk made safe? No. Pasteurization removes any essential nutrients and essential enzymes that may be beneficial to you, but not pesticide residue. It is now common knowledge that antibiotics, steroids and hormones are being used to help cows to grow faster and bigger, and these are not destroyed in the pasteurization process. Furthermore, drinking dairy milk means you consume a serious growth promoter called Insulin Growth Factor-1 (IGF-1). 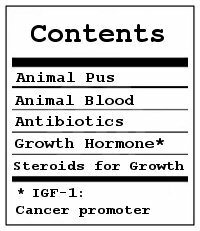 IGF-1 has increased risk for certain cancers and is very rich in milk, actually it's doubly rich in modern milk due to modern farming methods. We do make IGF when we're kids to make our cells grow quicker, but very little as an adult. Normally, it's produced by the liver. we're certainly not supposed to eat it! IGF can be easily measured in your blood and in one study on prostate cancer and men, those with higher IGF levels had three times the risk of prostate cancer. There have been numerous studies now linking IGF-1 with milk and breast cancer also. Milk contains 11 different growth factors and 35 different hormones. This has much to do with the fact that milk comes from pregnant cows. When pregnant, a cow's oestrogen and hormone levels are seriously high and if you think this is not ending up in the milk you drink, think again. It is now becoming common knowledge that cow's milk protein (found in ALL dairy products) is the leading cause of food allergies in adults and children. It is also common knowledge that diets low in dietary fibre cause constipation and in the long-term cause more serious conditions such as: hemorroids, hiatus hernia and varicose veins, and milk (and all other dairy products) has no fibre in it at all. 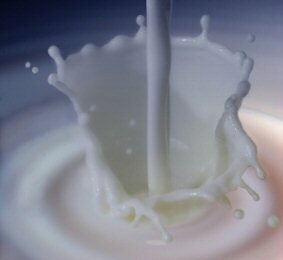 Marketeers often refer to milk as "nature's perfect food". Why is it then that in a research study in the USA it was found that 95% of Asian Americans, 74% of Native Americans, 70% of African Americans, and 53% of Hispanic Americans were all lactose intolerant?! Milk is the leading cause of iron-deficiency anemia in adults and children. It negatively affects the immune system. Many studies have shown rheumatoid arthritis (RA) sufferers (an auto-immune disease) cannot tolerate dairy products as they aggravate the condition. Scientists also think that it is the protein found in dairy that damages arteries, and believe low-fat and fat-free dairy products are just as bad for arteries as full fat ones. Cow's milk protein has now also been linked clearly to triggering type 1 diabetes. Diabetes is a serious disease: blood capillaries diminish and die throughout the body, including around major organs. Legs are often amputated because of Diabetes, and basically, because the body becomes very weak, it can trigger cancer cells to be activated. Calcium works alongside magnesium, and the ideal ratio is 2:1. Basically you should have twice as much calcium as magnesium in your diet. 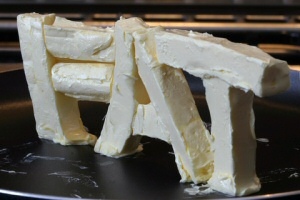 With milk however, the calcium magnesium ration is 10:1, and cheese is 28:1. So if you are using milk to get your calcium intake you will suffer from magnesium deficiency. Drinking milk is now strongly linked to heart disease. In an international study on milk consumption it was found that the higher a country's intake of milk, the higher the incidence of cardiovascular disease. This is due not to the fat content, in case you're thinking skimmed milk is okay, but by the lack of magnesium in your body. Magnesium, more than any other mineral, protects your body from heart disease. Calcium is available to you in many foods: dark green, leafy vegetables (broccoli, kale, etc. ), fruits (oranges and figs), legumes (beans), nuts (almonds) and sesame seeds are all excellent sources of calcium. There are no 'downsides' to these foods either. Furthermore, the calcium is better absorbed into, and used by the body than dairy products. And vegetables, fruit, legumes, nuts and seeds are ALL loaded with other nutrients, vitamins and minerals. So, it's easy to get your daily calcium needs met from a balanced, plant-based, whole food diet. What's really in the milk you drink? How many mothers, after reading those ingredients, would actually purchase it? None, we suspect. And they'd be right not to because dairy is quite simply a disease-encouraging food. It is linked to: obesity, autism, diabetes, Crohn's disease, colic, ear infections, a whole array of allergies, breast and prostate cancer, ovarian cancer, arthritis and joint pain, ADD and ADHD in children, headaches, heartburn, indigestion, irritable bowel syndrome, osteoporosis, anxiety, fibromyalgia and poor immune function. Milk is also linked to constipation, food poisoning, gallstones, kidney stones, migraines and more recently multiple sclerosis. Your body even produces an anti-body against milk. Prostate cancer is the most common cancer in men in the UK - it accounts for 25% of all new male cancer diagnoses. Recently, milk consumption has been linked to prostate cancer due to high levels of the compound insulin-like growth factor (IGF-1), both present in dairy products and in increased levels in the bodies of those who consume dairy on a regular basis. A recent study showed that men who had the highest levels of IGF-1 had more than four times the risk of prostate cancer compared with those who had the lowest levels. Breast cancer is the most common cancer-related death among women in most of the Western world and the leading cause of death for women under 50. The American Dietetic Association reports that breast cancer is most prevalent in countries where women consume high-fat, animal-based diets. In Asia, where milk consumption is extremely rare, breast cancer is almost unheard of. International renowned nutrition expert Dr. T. Colin Campbell points to China, a basically nonmilk-drinking country, where cancer deaths among women aged 35 to 64 averaged less than 9 per 100,000, as opposed to 44 per 100,000 in the U.S.
Japanese women who follow a more Western-style, meat- and dairy-based diet are eight times more likely to develop breast cancer than their counterparts who eat a plant-based diet not containing dairy products. A study funded by the National Dairy Council in the USA brought to light by accident that the high protein content of dairy actually causes calcium to be leeched by the body. Indeed, Yale University found that the countries that consumed the most milk, dairy, meat and other animal-based foods had the highest rates of osteoporosis after piecing together research from thirty-four published studies from sixteen countries. Another study that is interesting found that the Maasai, the only African tribe to drink milk (from cows milked by hand too) is the only tribe to have members suffering from osteoporosis. Studies from Yale, Harvard and the National institute of Health in the USA have not found in any studies that dairy acts as a source of good nutrition to combat or prevent osteoporosis. Milk and dairy products are not necessary in the diet and can, in fact, be extremely harmful. If you care about your health, let your thinking evolve and stop consuming dairy products today!